Last week the federal government issued a report about payments to health insurers under the Affordable Care Act. Many people interpreted that report as indicating a “windfall” for insurers. In fact, the opposite is true for BCBSNC: Even when you account for the significant payments we received from the federal government, we lost more than $123 million on our ACA business in 2014. How can that be? It boils down to the fact that ACA customers are sicker and use more health care than individual customers historically have — and more than anyone projected. We’re seeing costs go even higher as more people with more health problems seek more medical care. That’s why we had to request a significant rate increase for next year’s ACA business. Health care costs — and what you pay for health insurance as a result — are complex for everyone, actuaries like me included. Whether you’re a Blue Cross customer or not, you deserve a sound explanation of why your premiums are going up. Stick with me as I walk through what the report from the federal Centers for Medicare and Medicaid Services (CMS) means, why the federal payouts to insurers don’t fully cover our costs, and what’s likely to happen next year with respect to premiums. When the ACA took effect, it included some provisions to help stabilize the health insurance market and help insurers transition to the ACA. You may recall that in the past, insurers could deny new applicants for individual coverage based on their health history or charge them more to cover the cost of their care. Under the ACA, we can’t deny anyone coverage, and we can’t charge people more for being unhealthy. It was understood that insurance companies would see their costs go up as millions more people entered the market, many with very expensive medical conditions. That’s why the “three R’s” were put in place — so that insurers had a cushion against medical losses that could cripple their business. Reinsurance: Insurers pay into a fund that covers them for claims from customers with high health care costs. Insurers collectively were eligible for $10 billion in 2014. That number goes down to $6 billion this year and disappears after 2016. Risk Corridors: This program, also ending after 2016, gives insurers risk protection against medical claims going significantly higher than expected. Risk Adjustment: Insurers with a more healthy pool of customers are required to contribute to a fund that helps insurers with a higher-risk customer pool. This program is a permanent feature of the ACA, much like the protections long in place for Medicare Advantage. In its report last week, CMS said the federal government would pay a total of $7.9 billion in reinsurance payments — one of the three R’s — to 437 eligible health insurers. 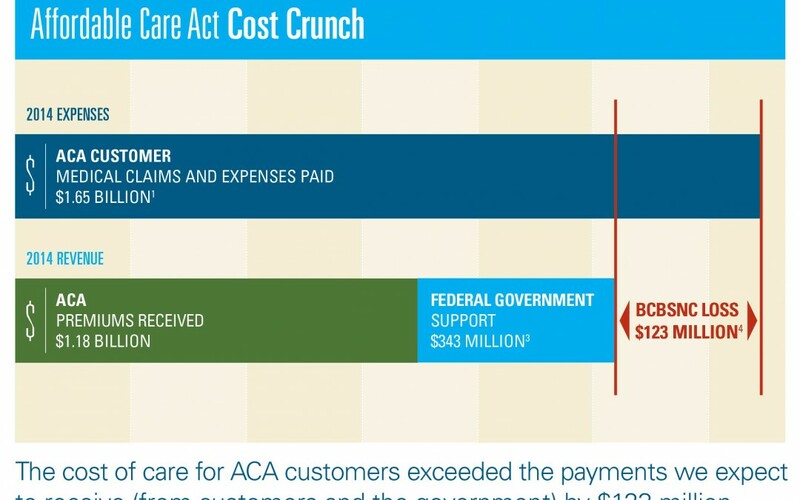 Those payments cover the 2014 benefit year — the first full year of the ACA. BCBSNC is receiving $343.4 million in total under the Three R’s, because we enrolled a large number of customers with health conditions that required a lot of care. There’s just one big problem: It only goes part of the way toward covering the added cost of our new customers under the ACA. For 2014, even after factoring in the amount we received from the government, we lost $123.4 million on our ACA business. That figure is pre-tax and applies to individuals under age 65 with an ACA plan. This trend is not unique to North Carolina. Many insurers across the country are seeing similar trends in their ACA business. If the individual insurance market is to survive, insurers must price their products to cover the costs of ACA customers. For this reason, we announced last month that our proposed rates for 2016 include an average increase of 25.7 percent for our ACA business (for customers under the age of 65). And that increase could go higher, because health care expenses for our ACA customers this year continue to soar — pushing rates even higher. Our top priority is to keep coverage as affordable as possible. To do that, we must work even harder to get rising medical costs under better control. It’s a challenging environment for everyone. 1, 2. BCBSNC Internal Data, 2015. 3. BCBSNC Internal Data, 2015. Includes an estimated risk corridor payment amount. That estimate is a percentage of the expected eligible amount, which has been reduced due to uncertainty regarding federal funding. 4. BCBSNC Internal Data, 2015. Patrick is Vice President and Chief Actuary for Blue Cross and Blue Shield of North Carolina. He has nearly 20 years experience in the health insurance industry with emphasis on the areas of group and individual pricing, valuation, product development, and financial planning.